« Further development of the EMU – should legitimacy come first or last? Dutch Prime Minister Rutte welcomes Commission President Juncker to Amsterdam, while the other members of the Commission cue up. The welcoming ceremony is one of the rare occasions that the public will be able to view during the Commission’s visit to the Netherlands. The European Commission will meet the Dutch chambers of parliament behind closed doors, at the latter’s request. 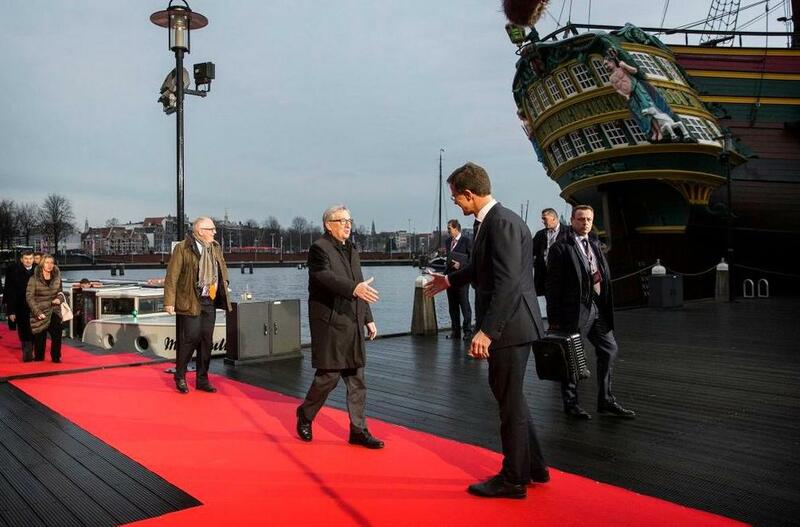 Yesterday, the European Commission arrived in the Netherlands for a series of meetings at the opening of the Dutch EU Presidency that last for the first half of 2016. An opening ceremony, including the taking of the traditional group photo, took place at Amsterdam’s stately Museum of Maritime History. This official reception however appears to be a rare public occasion during the Commission’s stay in the Netherlands. Dutch daily newspaper NRC Handelsblad today reported that the debate between the Dutch States-General (combining both the lower and the upper houses of parliament) and the European Commission, scheduled to take place today, will take place behind closed doors. It may be considered hilarious that the European Commission, which is often dismissed in the Netherlands as a bureaucratic monster, holds a democratic mirror in the face of the Dutch parliament. But above all, it is a disgrace for the parliament. In line with convention, the Dutch presidency has also opened its own presidency website. This website contains a detailed agenda of meetings over the coming half year and a document register searchable by date and by key words. At the time of writing, the register contained 11 documents. Among these was a presidency programme of priorities. This programme referred 12 times to the terms “transparency”, “transparent” and “open”, in contexts as diverse as European decision making, finance, defence, and the rule of law. Earlier this year, the Netherlands backed a plan launched by a number of member states to reinvigorate the transparency of Council decision making, igniting hopes of progress among transparency advocates. With the closed-door session however, the Netherlands, traditionally a transparency-friendly country, seems to have started off on the wrong foot. It remains to be seen whether the Dutch government will prove more willing to promote transparent European deliberation than its parliament. This entry was posted on Thursday, January 7th, 2016 at 1:57 pm	and is filed under Practice. You can follow any responses to this entry through the RSS 2.0 feed. Responses are currently closed, but you can trackback from your own site.